The new AC standard is here, with up to 866Mbit datarate, 256-QAM modulation and 80MHz channels. 802.11ac opens up new possibilities and speeds never possible before. 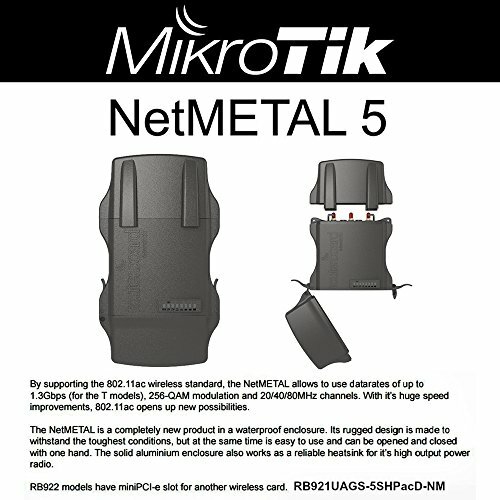 The NetMETAL is a completely new product in a waterproof metal enclosure. Its rugged design is made to withstand the toughest conditions, but at the same time is easy to use and can be opened and closed with one hand. The solid aluminium enclosure also works as a reliable heatsink for it's high output power radio. RB922 models have miniPCI-e slot for another wireless card.